MISTY MEADOWS SQUARE MEATERS STUD HAS MOVED to the beautiful YARRA VALLEY, just outside Melbourne, towards Warburton. We have down-sized to 60 acres, with fertile Yarra River flats and undulating hills. The best of our Square Meaters breeding herd came with us and have adapted well to their new environment. Visitors are always welcome - 530 STATION RD, WESBURN. Phone Christina on 0403 851 514 for more information on animals for sale. 8/6/18 COWS PTIC for sale. Registered Square Meaters breeders. Calves due from August 2018. What a great success! Square Meaters breeders and others interested in the Breed, converged on Misty Meadows on Saturday May 7th to attend the Square Meaters Masterclass for Beginners. They came from all over Victoria, and even ventured across the border from South Australia. True to its name, a heavy mist engulfed Misty Meadows early and hovered most of the day but this did not detract from the wonderful interactive learning process which took place during the Masterclass. Glen Jackson, a highly respected cattle breeder and former Director of the Square Meaters Cattle Association of Australia, and his wife Julieanne, drove 900 kms from their property, Glennholme Square Meaters (ph: 02 6543 1413) in central NSW, to conduct the Masterclass in Taggerty, Victoria. With many years of knowledge and experience behind him, Glen proceeded to give us the "practical nuts and bolts of cattle breeding specific to Square Meaters". Glen started with the Murray Grey - Square Meaters breed history. "It's important to know where we come from and where we are going" he said. "Square Meaters are arguably the most successful cross breed programme ever initiated because each of the originial breed puts its best attributes into the new breed with heritable repeatability. " He went on to explain how to select elite performing cattle, how to visually evaluate animals for top performance, how to set up a proven and successful breeding program specifically for Square Meaters, correct measuring techniques, tattooing , and cattle identification. A selection of bulls and heifers were in the cattle yard for the pratical demonstration of the principles he was teaching, with full hands-on participation from the attendees. Glen then moved onto marketing, natural cattle care, stock health and in particular, the importance of minerals in cattle performance. Mark Kemp, Square Meaters Breeder and Butcher, presented "What Butchers look for in a Carcass", knowledge which was truly welcomed by the Group. So much enthusiasn was generated by the Masterclass that people were still standing around the cattle yard at 6.30 pm, in the dark, engaged in animated conversation! About 20 folk stayed overnight in the area and we all went to dinner in Alexandra. It was an enjoyable evening, conspicuous by the continued enthusiasm for Square Meaters cattle, the Masterclass, and the newly formed Vic Breeders Group. "He (i.e. partner) gave it a 9 1/2 out of 10, and he usually doesnt go past a 7!" "Thanks for organising such an amazing day..... enjoyed it immensely.....Glenn really knows his stuff"
"I loved the day -It was great to catch up with others doing what we are doing..............breeding beautiful animals with all the attributes the Squares have. The mix of sit down learning and hands on was great and the yummy food and chat time in between were excellent." "Thanks again for hosting the event which I found both very pleasant and on the button." "Thanks or organising and hosting the excellent day.... I t was really good to see so many new members and so much enthusiasm, it certainly bodes well for the future"
A very special thank you to Glen and Julieanne. 8 Heifers go t0 Cluskers Square Meaters, A.C.T. With 27 heifers and two bulls for sale in September, we had a delightful visit from Su McCluskey of Cluskers early in the month. Yes, Su arrived one Sunday morning having flown from Canberra to Melbourne, and drove to the farm in spite of torrential rains, fallen trees and flooding roads! She spent several hours with us and closely examined all the stock for sale. A very wet trip around the farm enabled her to view the breeding herd and the bulls as well. Su and Bob purchased 8 lovely heifers sired by our own Misty Meadows Bounty B7A, Woolaringa Yarra Y73A and Woolaringa Bob B54A. We always learn from others when they visit the farm, and this was certainly the case from Su McCluskey who is a fountain of cattle knowledge. Thank you Su. 19 Heifers and a Bull to Dunmore Park Square Meaters, Bridgewater, Vic. A week later, new SMCAA members Rachael Fletcher and Lyn Young of Dunmore Park Square Meaters, along with their family, arrived to view the heifers. It was refreshing to meet them, and their excitement for the breed - contagious! They purchased 19 Misty Meadows heifers - with great bloodlines from Woolaringa and Kelkette Park. Rachael and Lyn have also taken ownership of a young bull, Misty Meadows Erik E48, showing good form for his age, and genetics from the champion WGA Leane S18 thru sire WGA Yarra, and dam WGA Leane X30 who was a junior champion. We wish them every success in their new Square Meaters venture. Misty Meadow's WGA Bob B54A to Bricklewood Square Meaters, Vic. 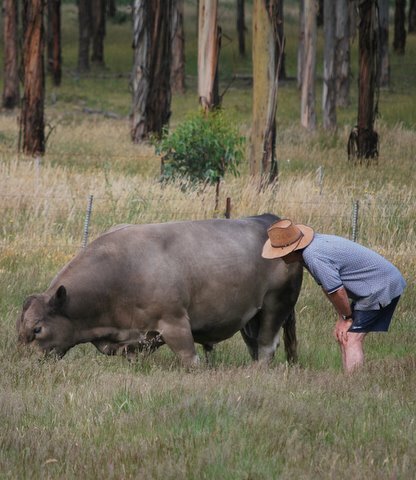 Several interested parties called about Bob the "gentleman" bull, but it was Bambi Quigley with a good eye for a bull who put Bob thru his paces before deciding he was to be a new sire at Bricklewood in NE Victoria. It was a pleasure meeting Bambi, and we wish her and Joan every success with WGA Bob. The heifers pictured below were born March 2009. They were sired by either Woolaringa Yarra Y73A or Misty Meadows Bounty B7A, both of these bulls have 8 Genstars for Tenderness and consistently throw excellent calves. Although 15 months old and of maturity, we prefer not to put the bulls with them till about 18 months as we feel that impregnation successes are better, and more importantly, the added growth makes for easier calving. Most of these animals will be for sale PTIC towards the end of the year. 2009 Spring Calves - looking good! Misty Meadows, located near Taggerty in North East Victoria has had fairly good summer rainfalls followed by whats considered to be great autum with good pasture growth throughout the two seasons - the result is that the cattle are doing well, and the 2009 spring calves are looking bonny indeed. Check out the photos of the calves, they are only 6-7 months old and most of them will be for sale later in the year. Visitors are always welcome to the farm, just phone ahead on 0403851514 / 03 5774 7020. UPDATE: All these animals have been sold. The 2010 drop will be available Spring 2011. Misty Meadows Square Meaters Stud has had a great spring, after a few rather disappointing years. Not only has the rain been coming down in steady patterns since June, we've had a lot of fun and success with our Square Meaters. A visit to the farm by Ernie and Fiona of the Woolaringa Stud inspired us to "get cracking" and spread the word in our area which at present is predominantly a black angus valley. We decided to enter a pair of cows with calves at foot into the local Alexandra Show, Class 4"Progeny most suitable for Feedlot or Domestic Market". Being first timers at this and with nerves jangling, the cow's bottoms scrubbed, the pair of two week old calves all spotless and cute, off we went. Could have blown us over with a feather when we won the Class!!! Everything else was won by angus cattle, but we'll be back in force next year. Super Square Sunday a funday! Two weeks later on 29th November, we held our first Super Sunday Open Day - again loads of preparatory work but such good value. Once word got out about our Open Day those who had been thinking of buying our Square Meaters promptly did so prior to the day. We had visitors from NSW and regional Victoria including Kyneton, Kilmore, Mount Evelyn and our local area, with the potential of new customers and new friends. Throughout all this, our "girls" kept on calving with 30 healthy new arrivals, sired by our stud bulls, Yarra, Bob and Bounty. Nice job boys! We wish everyone a very a happy and successful 2010. We come in lovely colours - even chocolate brown! WGA T13 in her 16th year! Ain't life grand with the Square Meaters! Misty Meadows is registered with the Square Meaters Cattle Association. Nothing on the horizon - to register for updates please say hello!